After a van attack in Barcelona that killed at least 14 people and injured more than 100 others on Thursday, police in Spain are seeing evidence of a broader plot that could have been even more devastating. This does not appear to have been a lone wolf attack but rather a much more complex operation involving several people ISIS claims were soldiers of the caliphate. Spanish authorities say it could have been even worse, that a much more destructive attack was being planned in a rented villa in the town of Alcanar. Plans changed Wednesday night when one of the group’s bombs detonated prematurely, killing one of the terrorists and causing the others to flee. They left behind at least 21 propane gas canisters that can be seen in the rubble, which officials believe were intended for use in a more sophisticated attack. “If these terrorists had been better bomb makers we would be looking at hundreds or deaths,” said John Cohen, the former counterterrorism coordinator at the Department of Homeland Security an an ABC News contributor. After the explosion, police say some members of the cell headed to Barcelona for the van attack in the famous Las Ramblas tourist area, while others ended up at the beach resort of Cambrils, where five of them carried out a second vehicle attack that killed one person and injured six more. All five attackers in Cambrils were killed by police. Spanish media reported on Friday that three of the remaining suspects sought by authorities — Moussa Oukabir, 17, Said Aalla, 18 and Mohamed Hychami, 24, all Moroccan nationals who live in Spain — were among the five suspected terrorists killed in Cambril overnight, while one suspect, Younes Abouyaaqoub, 22, remains at large. Police officials, however, did not confirm those reports. Four other suspects are in custody. 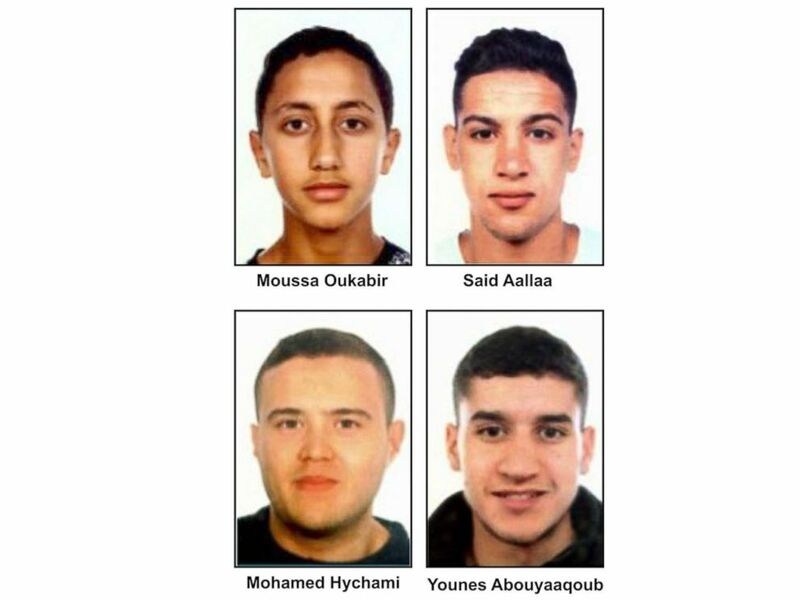 Suspects in the Barcelona attacks, from left, Moussa Oukabir, the suspected driver, as well as Said Aallaa, Mohamed Hychami and Younes Abauyaaqoub. Officials say the van used in the Barcelona attack was rented in the name of the older brother of one of the suspected terrorists, 28-year old Driss Oukabir. He was taken into custody and then released, police say, after they determined his brother Moussa had likely used his identification papers. The existence and the size of what the possible ISIS-inspired terror cell comprised of at least 11 men has alarmed U.S. and European counterterrorism officials. Officials say they still do not know the full extent of the terror cell, how long they have been plotting, how many there were, or what those still at large might do next before police close in. After it was confirmed that an American was among the dead in the Barcelona attack, the FBI dispatched a team of agents to Spain. Two sources in direct contact with US counterterrorism officials say the events in Spain over the last 24 hours make them fear that this is only the beginning of a series of ISIS-inspired attacks across Europe. Officials were concerned about a major series of attacks at the start of the summer and were surprised when things became fairly quiet. They fear the quiet may be over. The belief is that various potential attackers are not in contact with each other but will see the attacks in Spain as the sign to get moving. Thursday’s attack is just the latest in a string of deadly incidents throughout Europe in which terrorists have drawn from the ISIS playbook of using vehicles to inflict casualties. In August of last year, 86 people were killed on by a speeding truck driven by an ISIS follower in Nice, France. In December, 12 people killed in a vehicle attack on the Christmas markets in Berlin. And 14 people were killed in two separate incidents in London this year, one on the Westminster Bridge and the other on the London Bridge. ABC News’ Jack Date, Randy Kreider, Pete Madden, Cho Park and Margaret Katcher contributed to this report.